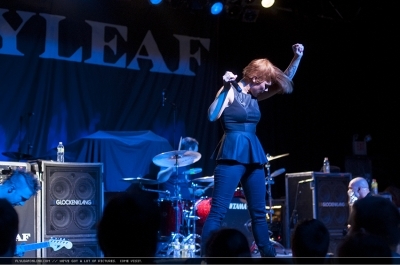 TLA Photos from FlyleafOnline & other ramblings! This show was pretty unique and special, and I’m glad I got to see it. Joel (Flyleaf’s retired drum tech) was on drums for the evening, and the two guitarists from Stars In Stereo subbed in for Sameer. I forget exactly why James and Sameer were away, but it was undoubtedly for a very good reason. It was the only Flyleaf show that they played with only 2 of the original members as far as I know. It was kinda crazy and a funny realization as I was standing there watching the show! But everyone did such a great job, and it was cool to see what they did with it.